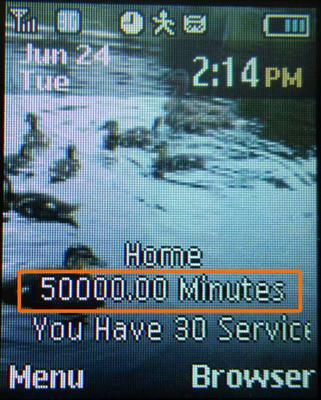 Yes I really did get 50,000 minutes on my Net10 phone. Okay, so what I really did was switch to one of the unlimited plans. I was running out of my pay as you go minutes so I needed to add airtime. However, I also planned to switch back from the S275g to one of their smart phones, so I decided to add the $40 unlimited airtime card now. First I called customer support, and they assured me I could go ahead and make the switch by simply adding the appropriate airtime card. I did have some problems a while back with making a switch from a pay as you go to what they called an easy minutes plans, so I wasn't that confident this would work, but I decided to go ahead and try it anyway. Once I had signed into my account on Net10's site and added the airtime card to the shopping cart, I did get a message that adding this card would remove and minutes and service time I already had on the phone. I already knew that was supposed to happen (and I didn't care because I only had about five or minutes or airtime left and a few days of service). The message at least reassured me that the process seemed to be going smoothly. I completed the purchase of the airtime card, and my phone updated itself in less than a minute. The screen now said I had 50,000 minutes and 30 service days left. I guess that's the only way to indicate unlimited service on this phone. Now in case you're wondering if that's really unlimited service, let me put your mind at rest. 50,000 minutes is equal to about 833 hours or about 34 days. So it would be impossible to use up my minutes in a month, though I believe it would probably be against Net10 terms of service if I talked continuously in an attempt to get as close as possible. I got a 5000 minute card and it added 50000 minutes. yay!!! Return to Net10 Samsung S275g.